2016 HONDA ACCORD LX.......4 Cylinder......ONE OWNER......... ONLY 32K MILES.....Silver With Black Interior...... !!!!!!!! CLEAN TITLE........BACK UP CAMERA.......BLUE TOOTH.......This Accord Looks Sharp, Runs And Drives Perfect, Loaded With Automatic Transmission, Power Windows,Power Door Locks, Power Mirrors, ABS, Air Bags, Tilt, Cruise Control, AM/FM/MP3/Aux And More,........ Comes With Clean Title And Warranty.........!!!!!!!!!!!!!!!!!!!!!!!!!!!!!!!! !.........Call Us Now to Schedule a Test Drive (818) 821-3181 OR Come See Us In Person at 5635 Tujunga Ave. North Hollywood CA. 91601...............Vehicle History Available ....... Low 1.99% APR Financing available For Qualified Buyers........WE HAVE MANY AFFORDABLE CLEAN LOW MILEAGE CARS IN STOCK. 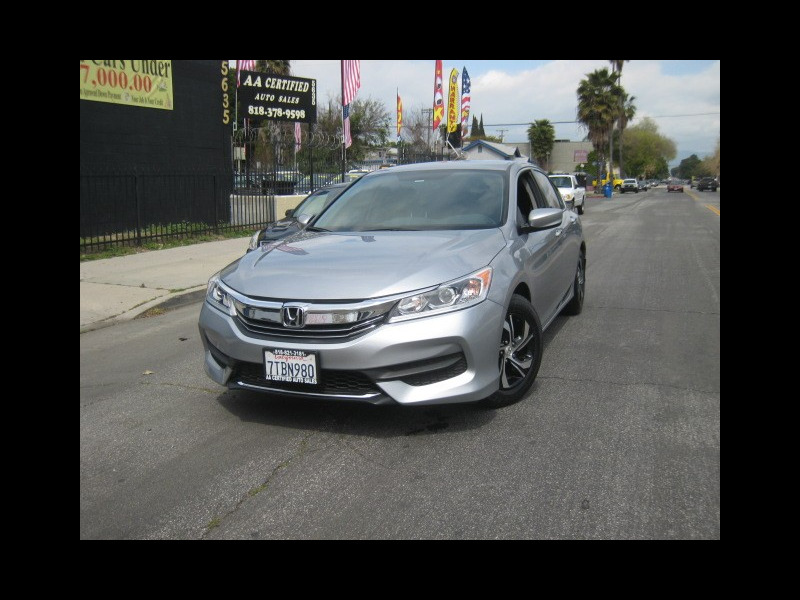 Visit AA Certified Auto Sales online at www.aacertifiedautosales.com to see more pictures and a copy of CarFax report for this vehicle or call us at 818-821-3181 today to schedule your test drive.